The cashiers at Palapas Tacos in Anaheim say they take orders in English and Spanish. The signs showing menu items are bilingual. But apparently something got lost in translation when it comes to the restaurant's daily specials. 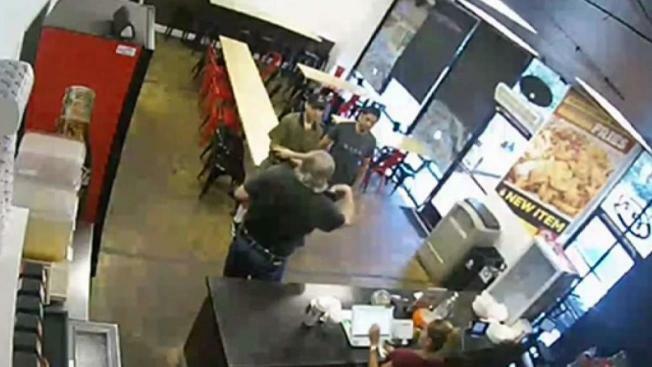 A security camera captured a customer's outburst at the restaurant counter Monday, when he tried to order the Friday special. Confusion appeared to stem from banners hanging outside the store advertising each day's special with the day of the week in Spanish. For example, the Friday special -- fish tacos for $1.99 -- is identified on the outdoor banner as "Especial de Viernes." Owner Juan Del Rio said the man apparently was upset because he was charged full price for the Friday special. "He saw the receipt and he saw that it was full price," said Del Rio. "That's why he gets mad." The cashier tried to explain that the Friday special was only good on Fridays. "It says it in Mexican," the customer told the cashier. "We're not in Mexico. We're in America." An employee also showed the man a sign that displays the daily specials in both English and Spanish. The rant spilled into the parking lot, where he threatened to call immigration authorities, claiming Del Rio was "not legal." It was that last comment that upset Del Rio, who said he has never seen that type of reaction from a customer in the two years he has owned Palapas Tacos. "People thinking you're illegal, just because you're Mexican, you know?" Del Rio estimated that about 75 percent of his customers are Spanish-only speakers. Until the Monday confrontation, he said he didn't realize the banner specials had not been translated into English. NBC4 was unable to identify the customer and contact him for a comment.